A flat roof is something which, if made correctly and with expert skill, will be strong and durable. A flat roof is the most common roof all around the world. According to climatic conditions prevalent in different parts of the world, a flat roof is of different utility. Places which have a moderately hot climate like the Arab Countries are the places where these kinds of roofs are mostly seen. These are very simple roofs and made up of very minimal material. The material which is used to build a house is the same material which is used to build this roof. Flat roofs look very good on commercial properties. There is no need for any special kind of material to make this roof. However sealing this roof is important. Sealing here would mean coating the flat roof with a material which will make it water and heat resistant. Whenever there are any damages on the flat roof, what you must do is consider repairing it. If the damages are more in number or may be patching them or just repairing them would not be enough then the only solution left will be reroofing the flat roof of your house. The need to reroof a flat arises when just repairing the flat roof is not enough. You can also patch the minute wear and tear on the roof, but reroofing is the only option when patching does not help. Replacing a flat roof entirely cannot be possible for everyone. Also it may not prove to be an economical option also. Not everyone can afford to replace an entire roof of the house with a new one. The most common reroofing technique is by using single ply rubber roofing system. In this particular technique the flat roof is reroofed with the help of placing rubber ply on the flat roof. This technique prevents the water collected on the flat roof to enter in the roof. Reroofing of the flat can also be done with a tar and gravel roof. A tar and gravel roof is made up of layers of tar paper and gravel. Also there is a wide variety of materials than can be layered with tar paper and gravel to make the roof strong and durable, even more than before. You can also use a waterproof flat roof membrane of any other material other than rubber. 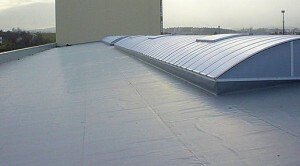 This kind of membrane will help in preventing the moisture to enter in the roof. The single ply rubber roofing system can be the best method to reroof a flat roof. Also the option of reroofing a plain flat roof with a tar paper and gravel roof is also a good one. Both these are nice options. But the best option is to cover your flat roof with waterproof membrane. Such flat roof coverings mostly provide insulation and greater protection also. Torch down roofing is another option which you can consider while you are reroofing your flat roof. Torch down roofing includes layers of bitumen-asphalt layers that are fixed to fiberglass. It is not as same as fiberglass roofing, but the differences are small. Here fiberglass is adhered to bitumen, asphalt with the help of heat just like the working of a torch. That is why this process is called torch down roofing. We have discussed about what are the options that you can consider when you want to reroof the flat roof of your house. We have also discussed about the best option regarding reroofing a flat roof. Flat roof replacement becomes highly important if it is not taken good care of or if its life span has passed. There are many options to reroof it and you can choose the best one as per your requirements. « How much does it cost to roof a house?